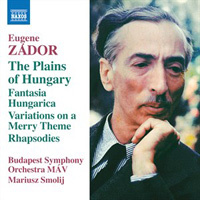 EUGENE ZÁDOR (1894-1977): Dance Overture, Fantasia Hungarica for Double Bass and Orchestra, Elegie “The Plains of Hungary”, Variations on a Merry Theme, Rhapsody for Orchestra (all World Premiere Recordings), Rhapsody for Cimbalom and Orchestra. Description: Well, this series hasn’t ended after all (it’s been two years since the last volume). Just to remind you, for 22 years, Zádor, a student of Richard Heuberger and Max Reger who left Austria after the Nazi Anschluss, was the orchestrator for Miklós Rózsa's film scores and this fifth volume concentrates on scores written after his retirement, all dating from between 1961 and 1970. More to the point, Zádor plainly enjoyed returing to his Hungarian roots at this time as his gift for melody and lyricism is flavored by folklore although all the musical material is the composer’s own. So then, another 78 minutes of colorful Romantic orchestral music for us to wallow in! Zsolt Fejérvári (double bass), Kálmán Balogh (cimbalom), Budapest Symphony Orchestra MÁV; Mariusz Smolij.